The 20th Century gave us thousands of scientific breakthroughs, but arguably the greatest of all has been an increase in life expectancy. Alexander Fleming’s 1928 discovery of penicillin meant that physicians could defeat deadly bacterial infections like pneumonia, rheumatic fever, and, beginning in WWII, infections from injuries and wounds received in battle. Vaccinations are credited with proactively saving millions of lives. Anesthesia makes more invasive surgeries possible, arriving at a time when “surgery shock” was a major cause of death. Consider that, from 1900 to 2000, life expectancy increased by an astounding 70 percent. What are the next advancements related to an increased lifespan? Where the longer lifespans of the 20th Century were the result of breakthroughs that kept threatening environmental elements at bay, so far, health science in the 21st Century seems focused on extending the lifespan of humans through healthier living. 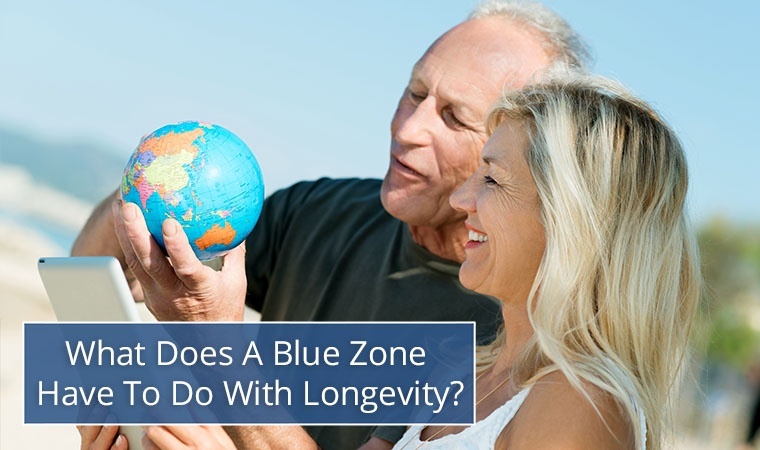 That’s the idea that inspired National Geographic’s Dan Buettner to study “Blue Zones,” which are the places on earth, including Loma Linda, California, Nicoya, Costa Rica, Sardinia, Italy, Ikaria, Greece, and Okinawa, Japan, with the longest average lifespans. Researchers tell us about 80 percent of the factors determining life expectancy are lifestyle influencers, while out of the remaining 20 percent, roughly 10 percent are genetic and 10 percent are related to the quality of available healthcare. This is great news for those of us who want to live longer by adopting a healthier lifestyle. What does Buettner’s research teach us? A plant-based diet: Low in simple carbohydrates and high in lentils, beans and nuts, Blue Zone people eat meat an average of only five times per month. Moderation: Called the 80 percent Rule, Blue Zoners tend to stop eating when their stomachs are 80 percent full. They also eat their smallest meal in the late afternoon or early evening, and then don’t eat the rest of the day. (They also tend to keep serving sizes to about 3-4 ounces [roughly the size of a deck of cards]). An afternoon glass or two of red wine: Just as science has taught us that moderate drinkers outlive non-drinkers, likewise, folks in all but one of the Blue Zones (Loma Linda Adventists) drink alcohol moderately but regularly. The key seems to be to drink only 1-2 glasses per day with friends and/or with food. Active environments: While Blue Zone centenarians don’t generally partake in a formal exercise regime, they seem to live in places that require them to consistently move around throughout the day. As a result, they burn 5 times as many calories as non-Blue Zoners, leading them to live 7 to 11 years longer. Less Stress: It’s not that Blue Zone people are immune to stress, but they avoid the kind of stress that leads to chronic inflammation (which recent research shows is associated with every major age-related disease). Interestingly, they shed stress through daily routines. For example, Okinawans take a few moments each day to remember their ancestors, Adventists pray, Ikarians take a nap, and Sardinians engage in a ritual happy hour. Belong to a community: An incredible 258 of the 263 centenarians Buettner interviewed belonged to some faith-based community (yes, there were only 5 exceptions). Family First Priorities: Successful Blue Zone centenarians take care of aging parents and grandparents either nearby or in the home, and make it a point to invest their time and love in the lives of their children. As a result, these priorities add up to an increase of 3 years of life expectancy. Social Connections: The world’s longest living people are connected to what Buettner calls “the Right Tribe,” which are social circles that promote and support healthy behaviors such as not smoking, moderate alcohol consumption, and plentiful laughter. Purpose: Having a purpose—a reason to get up in the morning—adds years to your life. (The Okinawans call it “Ikigai” and the Nicoyans call it “plan de vida.”) Knowing your sense of purpose is worth up to seven years of additional life expectancy. It seems that, for many people, a longer life is possible through healthier choices. By heeding the examples that people living in these Blues Zones teach about diet, lifestyle and values, you too could be ready to make a run at living well into your 90s … or beyond.